Cary, NC — December 11, 2014 – R+M, a brand experience agency focused on health, well-being and social responsibility, is ringing in the holiday season with the launch of its official Giving Goodness movement. Through the movement, R+M aims to inspire conversations and actions focused on giving throughout the year. This may include everything from group giving events, to day-to-day human kindness, plus everything in between. 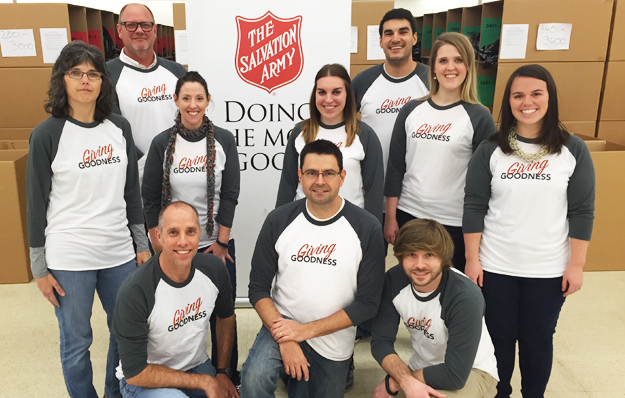 To kick off the movement, R+M closed its doors for Goodness and volunteered its time at The Salvation Army of Wake County. The R+M elves prepared 3,915 Toy Shop bags for families receiving gifts from the Angel Tree program. Those bags will hold toys, clothes and other holiday items and/or daily essentials for more than 9,500 children around the Triangle. In addition, the team channeled their inner children to build a large cardboard fort area housing toys for pickup. R+M encourages everyone to join the movement and the conversation on Facebook and Twitter, #GivingGoodness. R+M also invites its friends, clients and the public to participate in voting for what shall become the official conversation-starter Giving Goodness t-shirt. To choose your favorite design, visit bit.ly/GivingGoodness2014. Great idea!! You all rock! Q, was this your idea? Thanks Mitch!! At R+M, all of our best ideas are a team effort.